CAPTURE BRAND VOICE WITH CHARACTER DIAMONDS. While my number one pick for creating copy that converts is the creation of an interview-based Avatar Empathy Map, I firmly believe that won’t do you a bit of good until you’ve committed to a voice (or voices if you have more than one spokesperson) for the brand. What does it mean to define the voice(s) of your brand? 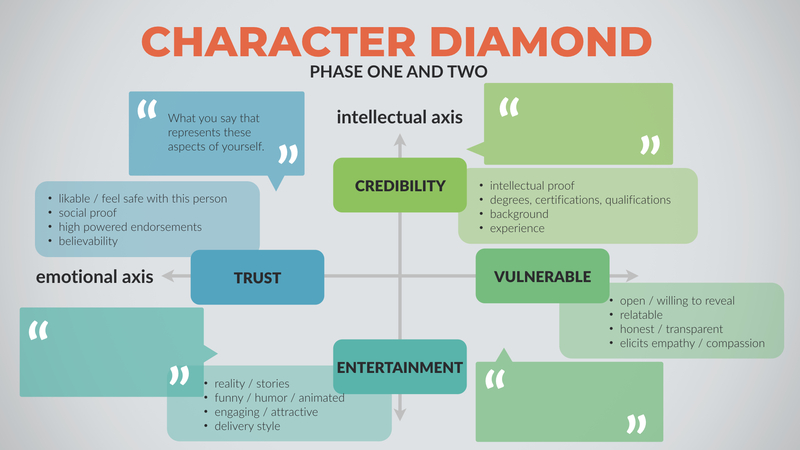 It means being clear on how you’ll balance the four aspects of personality represented on a Character Diamond: credibility, entertainment, trust and vulnerability. Once that’s done, you’ll clarify further by adding phrases, stories and characteristics that should show up in your copy and video content based on each quadrant. This gives communications from your brand a consistent flavor. The reason defining the voice of your brand is so crucial has to do with creating psychological trust. A person who is consistent throughout their content and communications is inherently more trustworthy than a person whose actions don’t align with their words. Congruence lays the path for trust, which is essential to build with your community. You will have very different conversations with people as they progress from discovering you to becoming a raving fan. Initial encounters need to meet them where they’re at and provide a solution to their problems. Then, you’ll need to support them through a decision making process, then through the execution of the solution once they buy, and you’ll continue to connect as long as they remain in your sphere. Your voice must remain consistent through all these very different communications. The mission must continue to be clear. Nothing I’ve found makes this task easier than creating a Character Diamond and keeping it in front of yourself when you write and your copywriters when they create for you. If you’ve never seen a Character Diamond, let alone created one for your brand, don’t worry. I’ve got you covered with a free Character Diamond template and when you grab it you’ll have access to a tutorial on how to complete it. We made you a video tutorial to make it easy! When you grab the free template, look for the link to watch the detailed tutorial I made for you. If you’re new to the process, you’ll appreciate the examples provided. If you need copy coaching or done-for-you copy packages, let’s hop on a call and see how we can work together. Q: WHEN DOES ONE DAY MAKE ALL THE DIFFERENCE? A: When a Strategic Marketing Officer and a high-converting copywriter spend an entire week examining your brand, your competition and your current marketing then spend a day serving up the findings to support you in refining your offer ladder, creating your content calendar, and a detailed execution plan for the next quarter. 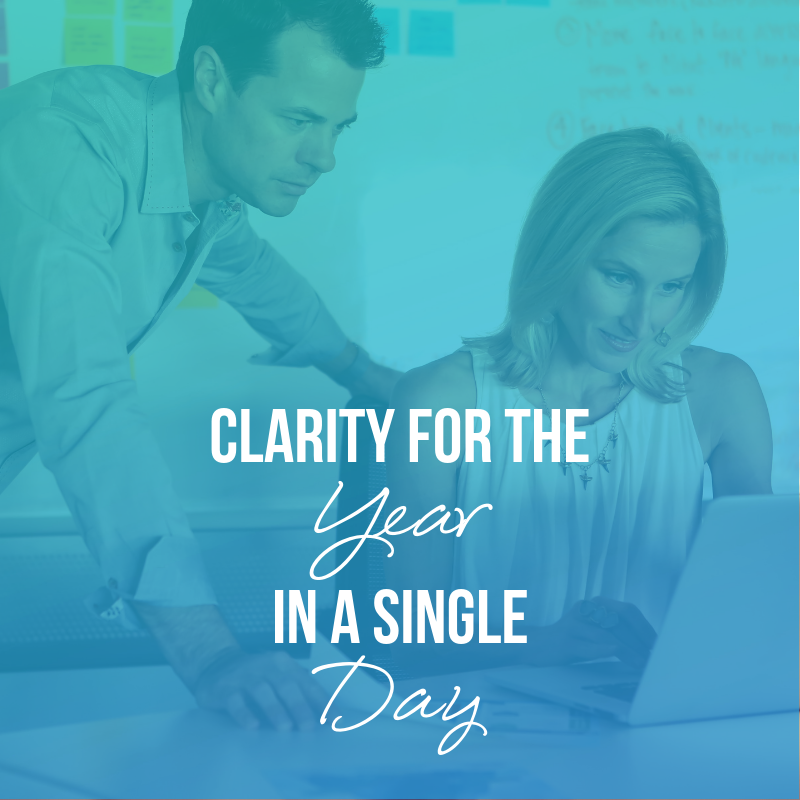 Take the guesswork out of your marketing by booking your VIP Strategy Day.